Chocolatey turned 5 years old recently! I committed the first lines of Chocolatey code on March 22, 2011. At that time I never imagined that Chocolatey would grow into a flourishing community and a tool that is widely used by individuals and organizations to help automate the wild world of Windows software. It's come a long way since I first showed off early versions of Chocolatey to some friends for feedback. Over the last 2 years things have really taken off! Note: While not a completely accurate representation of usage and popularity, the number of downloads gives a pretty good context. Going up by 7 million and then by almost 30 million downloads in one year really shows a trend. July 2010 – Nu (Package Management for .NET) is introduced and quickly takes off in popularity (I also wrote several posts about it). October 6, 2010 - NuGet is introduced. The Nu team had joined up with Microsoft in late August to work on NuPack (as it was called then). February 2011 - Joke with other folks on the NuGet team at MVP summit that if we ever introduced a machine package manager, we’d call it Chocolatey NuGet because it wouldn’t be vanilla NuGet packages. 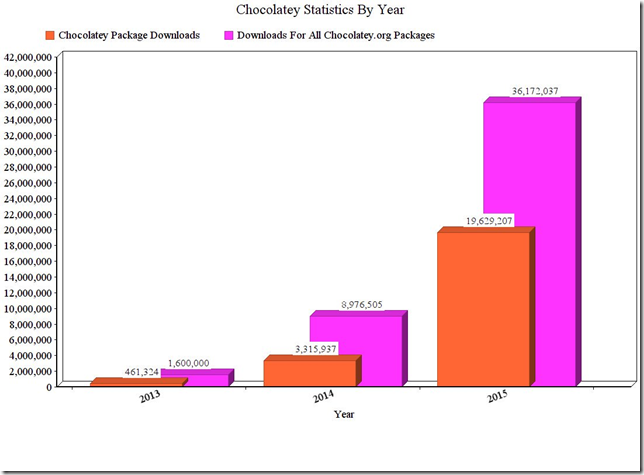 September 2011 - Community Repository (https://chocolatey.org) introduced. The community has been amazing in helping Chocolatey grow and showing that there is a need that it fills. Package maintainers have put in countless and sometimes thankless hours to ensure community growth and consumers have really found the framework useful! Thank you so much! The next version of Chocolatey is coming and it is going to be amazing. Here's to the next 5 years, may we change the world of Windows forever! # re: Celebrating 5 Years With Chocolatey!